Year of 2016 has been another great year of fun, adventure, running, traveling, self-discovering.. and most importantly it marked 3rd year in remission. Thanks to all the friendship and supports from my old friends, and my world is expanding with new friends I have luckily to have met this year. I am grateful that parents are healthy and active, and my sweetie is spreading her wings and exploring this world. Jan, I had kicked off my training for AR50, and I have been so lucky to have the greatest mentor and coach! Dennis outlined my training program, giving me pointers and supports, and coached me how to become a true ultra runner. Starting from the toughest training run I have ever had in Saratoga Gap, and I ran the CTR Crystal Springs 22 mile race as a training run. Feb, Michael and I went to run the most beautiful trail race I have ever done, and the slick rocks, water holes, Horse Shoe Bend… all were just beyond my imagination. And it’s the longest distance I had ever run at that point — 55K. At this race I found how stubborn and determined I am, and I am still proud of myself for not giving up. Quitting is just not my style! Mar, Dennis had me scheduled for another 50K race as training run, MUC50, and it was on a tough course and brutal stormy day. The wind almost blew me off the cliff, and I felt that I was one step forward two steps back when the rain dumping on me without mercy . But I finished, not getting sick, and I recovered well. That gave me sense of confidence that how strong I had become. Apr, the big day came — April 2, AR50. Michael drove me to Folsom, with Vinh and Kiyoko as my crews and cheering squads. And the mastermind and pillar of my becoming an ultra runner plan, Dennis, came to pace me to the finish with plenty of time under the cutoff. A race well trained, planned, executed, and accomplished. My ultra dream would not had come true without Dennis. After completion of AR50, I flew to Italy to run Rome Marathon as my “recovery run” :-p. It’s so much fun to meetup with Mark and Miranda and playing tourist in this ancient city so rich with arts, architecture, culture, and we devoured the freshest and authentic Italian cuisine and wine with Mike and May. After the race I ftraveled to Florence, Cinque Terre and Venice, and the beautiful scenery and solitude was the feast to my soul. I love every moment of it. May, after back to back 50mile and a marathon, I had decided to switch from training mode to just running for fun, and not going to run another 50 mile race this year. I wanted to make sure not getting burnt out from all the intense training, and spend time on other important things and people in life. I was honored that Dennis asked me to pace him at Quicksilver 100, and I ran the craziest costume race Bay to Breakers with my dearest friend Michael, Vinh, Kiyoko again! June, although I had no plan and intention to run another big race this year, but I got the opportunity to play part at amazing race — I paced at Western States 100. I had WS100 training run and TRT100 training run this month. All these runs gave me glimpse of how brave and strong one has to be to toe the start line of WS100, TRT100, and at the same time taught me that I need to overcome the toughest challenge to see what heaven looks like. July, Dennis asked me to pace him at TRT50 and it’s his way of showing me the most amazing scenery of Lake Tahoe at 9,200 feet. Not only it’s a fun weekend of running and meeting new friends, but also gave me an opportunity to see how one revived and bounced back from the lowest and darkest moment then pushed both mental and physical strength till crossing that finish line. This month I paced the SFM Half again, and once again helped runners crossing Golden Gate Bridge and brought them to the finish! Sept, a major mile stone for me, my sweetie left for college. The empty nest syndrome hit me so hard and there was just no way I could prepare how lost I felt. I was driving on the road aimlessly after work, doing grocery shopping twice a week on week nights, going to movie on Monday night.. doing all sort of things just to avoid coming to a very lonely home. I ran two half marathons and one 30K this month. I made myself busy every weekend. 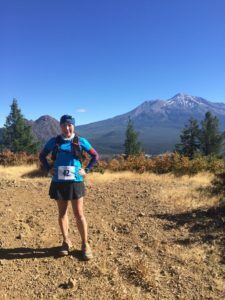 Oct, earlier this year Anita told me that she wanted to run a 50K this year, and she talked about Mt Shasta. Again, I didn’t want to be at the lonely home, so I was thinking about going out of town to run a trail race in Washington. It should be very pretty at this time of the year, and also a chance to visit Mark and Greg. But at the last moment I decided to go run Mt Shasta to show my support for Anita. However turned out that she didn’t make it. The extra cautious and over protective volunteers were super friendly on race day, but they also cost me a DNF 🙁 Nevertheless, the beautiful course, fresh air, million stars, and amazing post race hike to see the waterfalls made this a lovely weekend. Nov, another epic month just like Apr, I traveled to Japan to run Kobe Marathon and Fujisan Marathon, on back to back weekends. In between races I visited my favorite place Kyoto for the fall foliage, sake, matcha, then soaked in outdoor onsen in Hakone, the best izakaya experience in Tokyo. During this trip I also got to visit Randy, Mayumi, Hata-san and Sumita-san, and seeing them again was just wonderful. At the end of my marathon trip I went back to Taiwan to spend time with my family, and there is just nothing more treasure-able than that. Dec. people thought my running back to back marathons was crazy, but I shocked them by running North Face 50K after coming back from Japan 🙂 This tough course is not just a 50K, but a true ultra endurance challenge, but I did it well — PR 1hr 20 min, and I was feeling strong and happy at the finish. Again, I need to thank Dennis for a year of great running, and I was ready for my next challenge — ZION 100K in April 2017. Dennis has outlined my training for that, and there are exciting runs that we are going to run together. But life threw me a curve ball!! Before I got the chance to kick off my training, I slipped and fell at snowy Yosemite while hiking, and in result I broke my right foot. This injury not only ended my 2016 in low note, but also means I will be off running for at least 6 to 8 weeks, and there is just no way that I can do any of Jan, Feb and March training. Zion 100K is just not gonna happen. I was heartbroken and depressed, and I blamed myself for going on an adventure without careful planning and necessary gears. It has been two weeks since the injury, and honestly I had been so depressed. I missed my NYE run, and will miss my birthday run Woodside 50K tomorrow. But I knew that if I let myself consumed with depression and negativity, it wouldn’t help with healing anyway. And just because I can’t run Zion 100K, it doesn’t mean I cannot pick and run a different 100K in fall, right? I should be grateful that I am just broken now but not dead, and without the low, how could I appreciate the high, right? I have been truly lucky to explore many beautiful places, and tested what I am capable of in 2016. 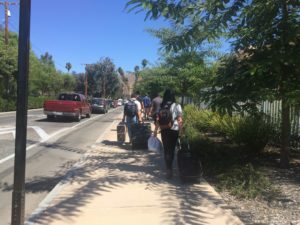 When I picked up my sweetie at SJC two week ago, I was surprised and happy how grown up she has become, and life is all about growing and learning, isn’t it? I will not be able to do my birthday run in the morning, but with enthusiasm and excitement I look forward to a new year of journey with fun, challenge, victory, health, friendship and love. Happy New Year everyone and Happy Birthday to me! It has been an amazing year Michele! And you accomplished so much! I can’t/won’t do Zion without you so let’s do it in 2018!